Readers who enjoy books that use Jane Austen’s characters in their writing will get much more from this book. We get to meet Jane Austen herself as she is writing her books and experience the moment when she finally becomes published. I applaud Scott D. Southard for this marvelous, delightfully written story which I place in literary fiction genre. I cried for Jane. I cried for another of the characters whom I can’t share his name—no spoilers here. I laughed at how the characters were described, acted and how outlandish some reacted to events. I’m sure this will be one of my better reads/listens this year and will stay long with me. A most laudable book with a laudable production. Bravo, bravo, bravo! You can read the entire review here (and I hope you will!). 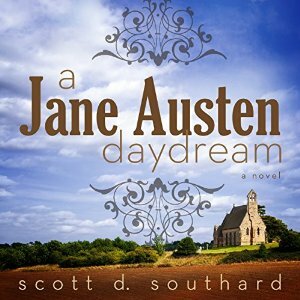 The audiobook of A Jane Austen Daydream is available on Audible, iTunes, and Amazon right now. And on each of the sites you can hear a different sample of the wonderful performance by Louisa Gummer. Check it out and grab your copy today! I’ll be part of a panel speaking about Jane Austen and writing this Wednesday! It will be on The Writing Show hosted by James Rivers Writers in Richmond. You can register to attend the event here. I hope to see you there!